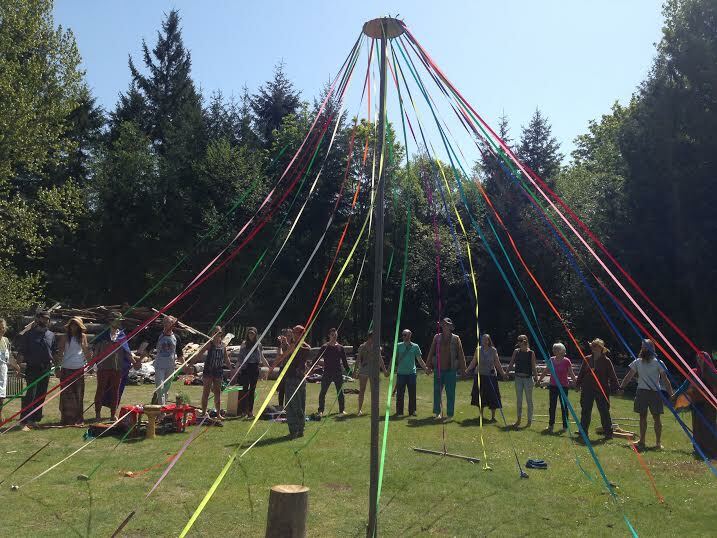 Almost seventy people stand in a circle in the fresh morning sunshine of Beltane at OUR Ecovillage on Vancouver Island. We are all here because we have followed our hearts and share the common desire to learn and grow our understanding of Permaculture as Earth Activists. There is an excitement in the air as I look around at the cross-­cultural, ­intergenerational group, ranging from ages 12­ to over 60, from New Zealand to Columbia. 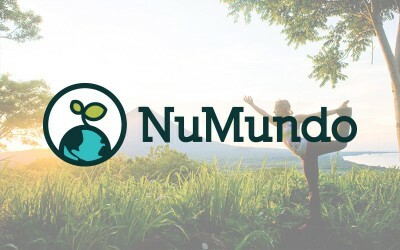 This eclectic tribe will share the next seventeen days together, exploring what it means to care for the Earth, humanity and future generations, and what actions each of us can take to support a all­-inclusive ethical Earth-­Based culture that can shift the current cancerous paradigm. Whenever I am lucky enough to be in nature in a community that values each member, I get a deep sense of peace and of arriving home within myself, being supported exactly how I am. 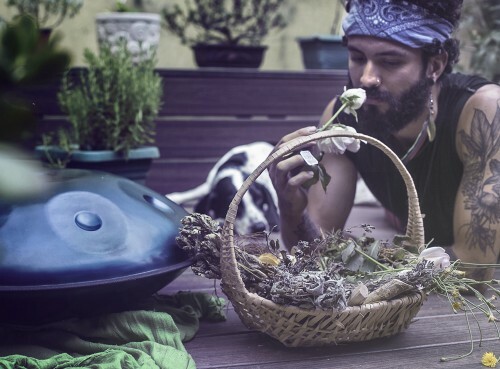 This is the opening ceremony and we start by closing our eyes and allowing our breath to connect us with the Earth, a simple practice that so quickly can bring us into our heart and the captivating sensuality of the body. It is like a switch is turned on and a warm, charged radiance fills my body from the Earth and life’s mystery tastes good all over. After some gentle stretches, StarHawk, one of our legendary teachers, asks us to bring our arms out to our periphery and allow our vision to expand outwards. I imagine myself like an owl, witnessing with a 360’­ wisdom what surrounds me. I notice it is not possible to have the mind pull me on a tangent and truly experience life in this way and so, as consistently as possible, I replace mental distraction with pure connection to the moment. This feels like it would be the first step towards being a jedi and it’s really fun! For the next ten minutes we are asked to be filled with wonder and take ourselves on a journey into the surrounding nature. ‘What is it like to be the water of the lake? What is it like to be the sparrow in the sky? What is it like to be the leaves on the tall tree top?’ I ask my imagination and allow the wonder to bridge the gap between my being and the qualities I can empathetically tap into when I approach each object from the perspective of Oneness and the same curiosity that I have had as a child. “Observe and interact”, the first principle of permaculture, is exactly what is allowing me to drop deeply into insightful reflections about the unique nature of that surrounds me and the purpose each form of evolution has in supporting the eco­system I am in. I notice the pattern of the branches and the efficiency in its design for transporting nutrients and maximizing the leaves ability to capture and utilize the sunlight. I notice the same branching pattern in my lungs and take a deep breath to enjoy and honor the divine intelligence of life. I acknowledge how my breath always deepens when I am in a forest, and the trees, the ‘lungs of the earth’, silently remind me how to breathe back into the rhythms of nature. We are hailed back together to cast the circle by the beat of StarHawk’s drum. We call in the directions, elements and give thanks for the ancestors and spirits of the land, a ritual which has become a familiar practice for me over the last two years of gatherings where ceremony has been recognized as a fundamental part of creating a safe and sacred space, and that brings us into right relation with the land we are on, the elements that create life, our place in the cycle of life and for us to recognize the sacred in each other. For this specific ritual we create a inner circle to face the outer circle as those who are called to walk in a clockwise direction sharing their insights about each element. I drop into that enchanted state that is conjured when we share the art of storytelling, as I am the listener in the outer ring I soak in each person’s snippet of insight before the next person’s story comes, like a new wave washing over me and the circle continues. Often sharing in a group can be intimidating but this style of storying telling offers a face to face sharing where everyone gets to offer a snippet of their truth to the group. It is amazing how quickly a group can become unified when we honor each other eye to eye. I have a flashback to my “London Days”, and the time when I dropped the contents of my bag all over the floor after being aggressively knocked into by someone rushing to the subway. It was the ‘norm’ for people to push others in the crowded underground as everyone rushed to something more important than respecting another human. It always made me sad to be surrounded by so my people and for everyone to be ignoring each other, avoiding eye contact whenever possible. It’s crazy to think of that reality still existing while I am out in nature taking time to genuinely connect with this community. What would need to happen for those people in London to transform into a thriving community? I think about how quickly the world’s issues could be resolved if we treated each other the way we would like to be treated and acted from the ethics of caring for the earth, caring for people and sharing fairly for the future generations (the three ethics of permaculture). As we conclude the opening ceremony with a song, I see that alone, each of us is a small, unique force of life with something important to offer but current social systems entrain the perception of separation. Until we as a collective acknowledge and honor that all life is interconnected, separation will continue to be a dangerous illusion at the heart of the global environmental and social crisis we face today. Thank for this sharing Sophia Fairweather​… I know the learnings we all gained have only just started to settle into our flesh,, deeply into our cores… our bones.. our breath was transformed.. each day.. through the calling of the elements.. our roots dug far and wide into Mother Earth.. every morning through the simple ritual of circling up and gathering as one body.. as a united group of seekers and finders.. OF the sacred.. of the truth of our interconnectedness… I know I have only just opened this understanding of self, connection to my passion and strengths..OH ya… wide and far my eyes can see… I will sit and write more soon.. as the words I can feel are right on my surface… blessed be.. and again I thank all who came and sank so deeply into this Earth Activist training.. – all who held space for us…. fed us each day, prepaired the places…… the cooks, Laura Moore​ and Steven Ranger​, Amber Finn​ and Others… and kitchen crews- mostly home steaders – Alana​, Garretts​, Dani, Wes,Katrina, Kanex, Noah and Camiee and Nick!!! ,,, the Villagers – Brandy Gallagher​, Satiya Channer​, Scott Kelly​ ,Trent and Jacop! PLUS of course our teachers. and TAs StarHawk and Charles, Mark Lakeman​, Drea Phoenix​, Curtis Robinson​ and and and… OM … our circle is open but unbroken… merry meet and merry part and Merry meet again! !